October is one of the best months to visit Eureka Springs. Not only will you start to see some of the best fall foliage in the Ozarks, you might run into a ghost or two! Don’t miss out on these great lodging deals and things to do sure to make your Halloween thrilling! The Spirit of the Crescent package invites you to spend the night with “guests who checked out but never left.” This package includes a 1 night stay, Breakfast for 2, 2 Tickets to the Ghost Tour, 2 Ghost Coffee Mugs and 2 Ghost T Shirts for only $259. The Paranormal Pair package is your chance to stay at Two Haunted Hotels: the 1886 Crescent Hotel’s and the 1905 Basin Park Hotel. On the first night, explore the haunted hallways with 2 tickets to the Crescent Ghost Tour. On your second night experience the Spirits of the Basin Tour. That’s a two nights stay and two tickets to two separate ghotst tours for only $329. On October 28th, The Intrigue Theater will return to the Eureka Springs Auditorium for the 6th annual Halloween Show. This year will feature a new segment: Echoes of the Witch Trials – the Ghost Talker faces the Gallows. If you have seen Juliana Fay’s Ghost Talking performances – you know it has the potential to convert harden skeptics into believers. Blindfolded on stage, she listens to what the spirits convey – and is able to make the connection between the spirit world and members of the audience. Buy your tickets today and be sure to use offer code “noose” for $5 OFF EACH TICKET! 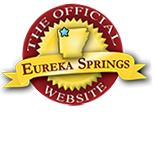 The Eureka Springs Historical Museum will host its 8th annual “Voices from Eureka’s Silent City” cemetery walking tours. Join the fun October 19th – 21st and again on October 27th and 28th. Tours depart every 20 minutes between 5:30 and 8:30. These living history tours feature live actors in period costumes portraying early citizens of Eureka. This event is both spooky and educational! Tickets are $10 for adults, $5 for children 12 and under and may be purchased at the Chamber of Commerce, Cornerstone Bank, or at the Eureka Springs Historical Museum. Join Turpentine Creek Wildlife Refuge for their annual Halloween celebration, the biggest Halloween Party in Eureka Springs! This is a family friendly event and features music, games, costume contests, haunted hay rides and more!This is a animal lovers favorite since it is the only time of year to see the Refuge’s animal residents at night! Admission is $20 adults; $15 ages13-19; $10 ages 4-12 years and Seniors and all proceeds benefit Turpentine Creek Wildlife Refuge. On October 28th at 6 pm, the 6TH ANNUAL Eureka Springs Zombie Crawl will begin its slow descent in front of the Public Library on Spring Street. A creeping parade procession of funeral hearses, doomsday vehicles, and post-mortem street performers will lead the hungry horde of the undead. Want to join in on the fun? Professional makeup artists will be in Basin Park before the annual Zombie Crawl to assist would-be zombies with special effects makeup from noon to five pm. After the parade, join the Dance of the Dead, a 21-and-above after party Upstairs at Grotto. This entry was posted on October 5, 2017 by service424 in Basin Park Hotel, Crescent Hotel, Family Fun, Fun Downtown, Ghosts, Lodging Specials, Things to Do and tagged America's Most Haunted Hotel, Eureka Springs, Fall Foliage, fall foliage in the ozarks, ghosts, haunted, Intrigue Theater, Turpentine Creek Wildlife Refuge.